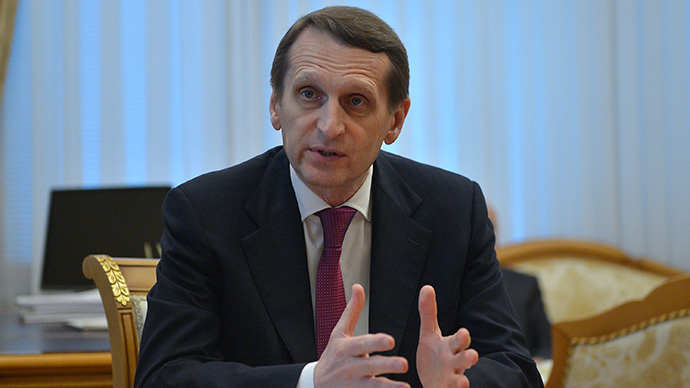 The Chairman of the State Duma has urged the President of the Parliamentary Assembly of the Council of Europe and its members not to make more mistakes over Ukraine and try to resolve the crisis in the country. On the day you receive this letter I plan to publish it in the media. This is the first time I have done such a thing, but am forced to act this way in order to be heard. This speaks volumes in itself. It tells us the media hysteria in Europe has reached a peak, and we have no more confidence in the formal means for exchanging opinions (nor in PACE debating procedures). As President of an assembly that is supposed to elicit truth by discussion, I’m sure you cannot but feel concerned about it. I am certain you wouldn’t want to go down in history as someone whose presidency saw PACE cease to exist as a representative body. And I doubt the present PACE members crave Herostratic fame as they undermine the efforts of the millions of Europeans who spent two decades forging a better future for our continent. It is obvious to me that their motives are sincere, and there is still some hope for them. Yet now is a moment of truth for all the people of Europe. I hope you take it for a fact that both Russia and Ukraine are European nations. But by now, it has also been established as a fact that it wasn’t Russia, but an ill-administered “EU integration” that has triggered mass human rights violations in Ukraine, and sparked unprecedented civil unrest in that country. It was the inept integration policies that have helped propel in Ukraine’s offices of power individuals who openly call for Nazism and segregation. I refuse to believe that you can consider those people “democrats,” or regard the Molotov cocktails dispatched across many of Ukraine’s regions as an indispensable part of EU integration. We don’t like this kind of integration. Neither do we like the crude anti-Russian campaign imposed from the outside, which the Russian delegation members have tried to convey to the Assembly. But their opinion was ignored, and you joined the side of those who hid their heads in the sand avoiding the truth and chose not to hear our arguments. However, it surprised me just as much that you didn’t support the European parliamentary system when so-called sanctions were imposed on the chosen representatives of an entire nation. As the Duma Chairman, I find one other thing strange. It’s well-known that no democratic parliament ignores the violations of journalists’ rights. Freedom of speech, veracity of information, providing journalists with access to war zones were always one of the criteria of a government’s democratic or antidemocratic nature. They were used in PACE on numerous occasions, by the way, to throw mud at Russia during the North Caucasus conflict. I don’t believe you are unaware of that and I don’t believe you are unaware of the blatant violations of journalists’ rights in Ukraine and the ban imposed on Russian media workers trying to enter the country. Tell me, why is such a burning issue swept under the carpet in PACE and the lying anti-Russian propaganda is spread in the European media instead? Who is being intimidated and for what purpose? Surely not to create new confrontation zones? You have to be not only deaf (which the Assembly has successfully been doing), but also absolutely blind not to see the similarities between the Kiev ‘Euromaidan’ and the destructive events that took place on the squares of Arab countries during the notorious Arab Spring. I assume you know that ‘maidan’ is Arabic for ‘square’. How many European squares, do you think, can be chosen as testing areas for ideological diversions by external forces? Or do you not consider Kiev a European city? I strongly urge you not to generate tension right on the EU borders. It’s a dangerous game, especially if you use only the convenient facts and disinformation. Instead, you should have brought the nationalists in Kiev to heel and demanded Maidan be cleared of bandits back in January and February. In March, you should have spent less time with the new Kiev authorities, and more in south-eastern Ukraine to study the situation thoroughly and meet the people, not to mention personally attend the referendum in Crimea. I am sorry you didn’t want to see the people’s joy and happiness for yourself, both when whole families came to the polling stations and when the results were announced. I’m convinced that if you and other members of PACE had been there, the PACE resolution on the subject wouldn’t characterize the outcome as “implausible”. The truth cannot be bent, it’s either there or it’s not. There’s no third option. And lastly, you can’t turn a blind eye to the fact that the Ukrainian authorities allow Nazi followers to openly march in the streets. The explosives and guns that the protesters started using in Maidan are now pretty much common in Ukraine. The country’s economy is ravaged, and the number of robberies and other crimes is steadily growing. I’m afraid that by now not only individuals, but whole families stock up on arms for self-defense. And the only reason for that is because the current Ukrainian authorities are unable to maintain law and order and protect civilians. I think you understand very well what this might lead to, just like you understand who was really responsible for murdering and burning alive the people in Odessa. The Ukrainians themselves started calling this heinous neo-Nazi crime ‘the Odessa Khatyn’. Will you really look the other way now, when the entire world is shocked by this tragedy? I believe urgent inter-parliamentary consultations on the Ukrainian problem are needed, with Russia as one of the participants. I am very sorry that these terrible events unfold during your presidency. I realize you’re having a difficult time right now, but PACE and the Council of Europe should safeguard human rights and help protect people’s lives and interests. Of course, I would like to tell you a great deal more. My letter is addressed not only to you but to all the honest members of the Assembly. However, you personally have considerable power and political experience and you know how important the President’s position is in terms of ensuring a comprehensive dialogue. I’m convinced that even with the mistakes already made there’s still a chance to restore peace in Ukraine. We can’t pass it up. But I will say this again: it will be impossible to achieve without Russia. Dear Madame President, restoring trust is of vital importance to all of us. We need to listen to each other, no matter how difficult a task that might seem. So again, I urge all of our PACE colleagues to listen to the voice of reason. We, as parliament members, can’t cross the line and cause irreversible consequences for the future of the entire Europe, and maybe even the entire world. And so I ask you and all the Assembly members who really want to resolve the Ukrainian crisis not to make any more mistakes. I hope that the Russian delegation’s rights in PACE will be fully restored. After such a decision is made, I am willing to personally attend a PACE session and address its members.